With the drop box safe and depository safes for sale at Value Safes, keep your money and other valuables secure and protected. These safes are ideal for business owners, and we offer a variety of options when it comes to keeping your possessions secure. All of our depository safes come with a drill resistant hard plate, “shark teeth”, and other features designed to make them as secure as possible. No matter what you are storing in these safes, protect yourself and your belongings from theft by taking advantage of our products. Although these safes are not fireproof due to their drop slot opening for cash, these safes are not designed for home use. If you own any type of business, use these safes on a daily basis to store cash deposits and other valuables until you need to withdraw them. 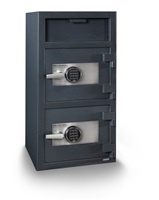 We invite you to browse our site to learn more about each of our depository safes for sale. If you have any questions about our drop box safes contact the professionals at Value Safes today for more details. 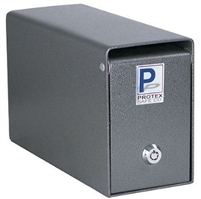 The Protex SDB-100 under-the-counter drop box is ideal for cash, checks, and small envelopes. Featuring a tubular lock and a solid steel hinge/dead bar preventing removal of the door, it’s almost impossible to get into! The safe includes four pre-drilled anchoring holes and anchoring hardware for easy install. 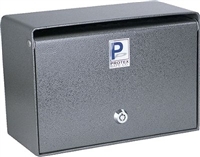 The Protex SDB-101 depository safe is an under-the-counter drop box that’s designed to hold cash, checks, and envelopes. 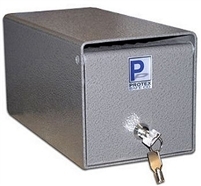 This drop box features a tubular lock and a solid steel hinge/dead bar, preventing removal of the door. 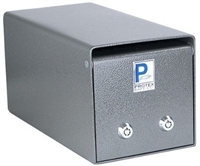 This safe is the perfect solution for restaurants and small retailers to minimize on-hand cash on premises. 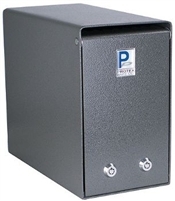 The Hollon KS25P is a drop box safe constructed of high quality solid steel that features a drop slot suitable for envelopes. This safe features predrilled holes that can be used to bolt the safe down to almost any surface. If you choose, you can even drill holes in the back in order to mount the safe on the wall. This safe weighs approximately 17 lbs. and is 8” x 6” with a depth of 12”. The Hollon KS25EL is a drop box safe constructed of high quality solid steel that features a drop slot suitable for envelopes. This safe features predrilled holes that can be used to bolt the safe down to almost any surface. If you choose, you can even drill holes in the back in order to mount the safe on the wall. This safe weighs approximately 17 lbs. and is 8” x 6” with a depth of 12”. The Hollon DP450 Depository Safe is a versatile, high quality safe that would be perfect for your home or office. This safe features easy operation, either by using the digital keypad or using either of the two included keys. Your deposits made through the drop slot will be protected by the thick 11 gauge solid steel construction. This safe features easy programming, and runs on 4 AA size batteries. Weighing 50 lbs, this safe is 18” x 13 ¾” with a depth of 11 ¾”. 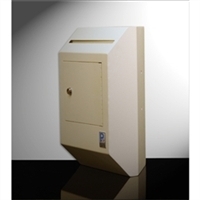 The Hollon HDS-03D Safe is one of our most high quality and secure drop box safes. 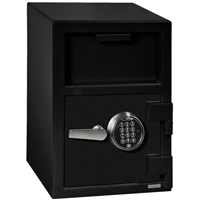 This safe features a group II dial deposit lock with a spring-loaded active relocker bolt. All your deposits will be safe and secure behind the ¼” thick steel body walls and ½” thick door. Easily mount this safe by using the 4 pre-drilled mounting holes. It weighs 31 lbs., is 12” in height by 8” wide with a depth of 10”. The Hollon FD-3020EK is a high security b-rated depository safe that includes many features to keep your deposits secure. 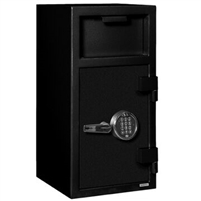 This safe includes both a dual key lock on the top door, and a bottom door that uses a multi-user electronic keypad. For utmost security, this safe is equipped with an anti-fish baffle, an internal relocking device, and a dead bar to prevent door removal. Easily bolt this safe to the floor using the included pre-drilled anchor holes. This Hollon FDD-3020CC is a B-rated depository safe that features an anti-fish baffle, an internal relocking device, door dead bar, and a drill/ballistic resistant hardplate. For added security, you can easily bolt this 180 lb. safe to the floor using its four pre-drilled anchor holes. Both doors require a combination dial lock to gain entry. Everything is contained within thick solid steel construction, ensuring protection of your deposits. This safe is perfect for your home or office. The Hollon FDD-3020EE is a high quality and secure b-rated depository safe that includes many features to keep thieves at bay. The safe comes equipped with an internal relocking device, an anti-fish baffle, drill resistant hard plate, and a heavy duty dead bar that prevents door removal. This 180 lb. safe can easily be bolted down to your floor using the included pre-drilled anchor holes. Easily open either safe door using the multi-user electronic keypad.